Few pictures of unknown owlets from my brother got me interested in finding more about them. While searching for owl related books last year, "Wesley The Owl" by Stacey O'Brien, popped up during a random search. This book was first published in June 2009 with some interesting reviews by readers. I don't normally read or care too much about other people's reviews or opinion without reading that book myself. Most people might find this odd. I just feel that personal opinion doesn't really reflect author's thought or experience. Even as I write this review, I am not telling you if I recommend this book or if I am giving a one (the worse) or five star (the best) to any book. My point is to, hopefully, from a birder's view, you may open your mind to read this book and make a judgement yourself. Stacy O'Brien is a real person, a musician, a wildlife biologist and a writer. While working in a research lab at Caltech in the mid 80s, she adopted a 3 day-old baby Barn Owl. Since then her life was never be the same. 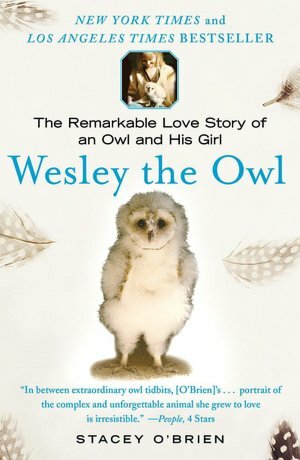 In the next 18 years of her life after the adoption, she raised this owlet,Wesley, with her unconditional love and sacrifices from feeding him, bathing him, accompanying with Wesley's first walk and first fly to watching him grow into a handsome young Barn Owl. Wesley and Stacy shared many happy days and they also had their up and down moments. A lot of laughter and tears. Stacy even recorded many sounds made by Wesley, which had never been documented before. I learned so much about Barn Owl's life and behavior not only from a biologist but from a person simply opened her heart to a harmless owl . Not to mention her tremendous contribution to the owl research community, her devotion, love and commitment towards a wildlife was the real reason drew me into this book. If you are a scientist looking for some scientific evidence or if you are a person without much imagination, you might find it boring. But it's not too late for you if you are someone with a young heart and/or care for wildlife. The spirit of Wesley, the owl's way, has inspired people from all over the world and this book has been translated into many languages, including: Chinese, Portuguese(Brazil), Italian, German, Korean, Polish and U.K. English (in England, Ireland, Wales, Scotland, and Australia). It is currently being translated into Hungarian. It is fun and easy to read and I also got an audio CD set so I can listen to it whenever I am on the road. Meet Stacy O'Brien here. When you slow down your footsteps, you'll find out that many things drew you into them, especially, birds.